HAWTHORNE, N.Y., Aug. 31, 2015 /PRNewswire/ — When you think of direct-response marketing power players, only a few people come to mind. As Seen on TV industry veteran and Allstar Products Group President and CEO, Scott Boilen, is at the top of list. The man behind Snuggie, Boilen is featured in the “20 People to Watch in 2016″ from HomeWorld Business Magazine. Boilen founded Allstar Products in 1999 as a direct mail marketer and later repositioned the company to become a leading As Seen on TV marketer and distributor. 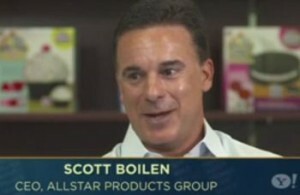 Under Boilen’s leadership Allstar has put more than 100 products on retail shelves in two decades. Since inception, Boilen has lead Allstar through many successful As Seen on TV rollouts including the famous Snuggie ®. The blanket with sleeves has sold more than 33 million units since becoming a viral sensation in 2009, and it was this popularity that helped cement Allstar to national DRTV prominence. 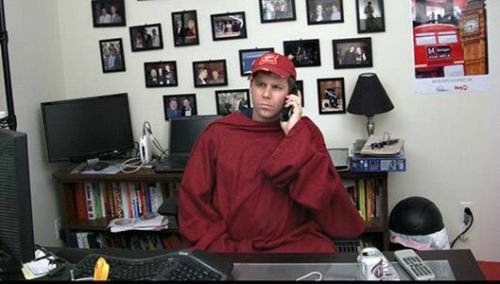 “The Snuggie was one of the first products that really went viral thanks to the rise of social media. This social buzz set a new standard for our business. Just as our products evolve with audience demands, so does the way we market our inventions. A strong social media presence is now an integral part of our marketing platform,” says Boilen. HomeWorld Business Editors listed Boilen one of the power players to watch because success in the housewares business is about finding the right formula to stay successful not just once, but time and time again. Allstar’s smart social, TV, and digital promotions along with the distribution of the right product has led to long-term, multi-SKU retail brands such as the Perfect cookware line which included thePerfect Bacon™ Bowl, or Hot Beauty accessories with Hot Buns® and Hot Designs®. Hoping to continue this success into 2016 Allstar is currently rolling out nine new TV-supported retail items nationwide. This is the most holiday rollout items in the company’s history. The HomeWorld Players list is a representation from a cross section of a diverse housewares business – from established to newly installed company leaders. The group is diverse, not just in the scope of their businesses and responsibilities, but also in their individual experiences and contributions to the industry. All, however, have played a role in shaping the housewares industry. About Allstar Products GroupAllstar Products Group is a leading direct response and consumer products company making quality products available to U.S. and international consumers through direct response television as well as internet, direct mail and retail channels. Allstar Products has a diverse product portfolio including popular consumer brands such as Snuggie® Magic Mesh®, Hot Designs®, Secret Extensions® and Wobble Wag Giggle®. This entry was posted in Scott Boilen in the News and tagged Allstar Marketing Group, Allstar Products Group, DRTV, press release, Scott Boilen, Snuggie on August 31, 2015 by ScottBoilen. In a 2013 article titled, “Snuggie: Social media’s first viral success,” Melissa Hincha-Ownby explores how the Snuggie® was a leader in social media marketing and viral videos. “Social media is a powerful tool,” Hincha-Ownby begins her article, “and if anyone doubts the power that Twitter, Facebook, YouTube and other social media sites have then they merely need to look at the success of the Snuggie.” She goes on to discuss how social media helped Allstar Products Group – the makers of the Snuggie – achieve skyrocketing sales. 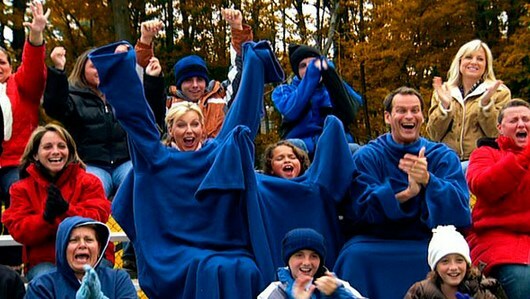 It was noted that Snuggie commercials received millions of views on YouTube and Snuggie parodies received even more attention. This entry was posted in Scott Boilen in the News and tagged Snuggie, snuggie social media, social media, Throwback Thursday, viral videos on July 2, 2015 by ScottBoilen. The article, titled “Snuggie gets a warm embrace from pop culture” notes how “Snuggies seem to be everywhere.” On Facebook and Youtube, on the Tonight Show and the Ellen Degeneres Show, even among the crowd at Obama’s inauguration. “Every once in a while, a product transcends advertising to become part of pop culture,” Scott Boilen, president and CEO of Allstar Products Group said in the USA Today article. “Snuggie got the highest rating ever for any product….” Scott Boilen goes on to say. Today Snuggie is a permanent part of pop culture and the Snuggie line continues to grow. This entry was posted in Scott Boilen in the News and tagged Scott Boilen, Snuggie, Throwback Thursday, USA Today on June 4, 2015 by ScottBoilen. A recent Yahoo Finance article discussed “surprisingly simply ideas” that have both resonated with a broad range of consumers and became products which generated huge sales. Included among the list is the popular As Seen on TV product, the Snuggie. The Snuggie, created by Allstar Products Group, appears like a simple idea that could have been created years ago. “It’s definitely one of those ideas that’s so simple that a lot of people might say to themselves, ‘Why didn’t I think of that?’” says Scott Boilen, founding member and president and CEO of Allstar Products Group. “It had actually been around in various forms for a few years with similar products available in the backs of catalogs, but nobody really knew about them,” Scott Boilen continues, so Allstar decided to create and market their own version. The rest is As Seen on TV history and soon we all saw the Snuggie go viral! This entry was posted in Scott Boilen in the News and tagged Allstar Products, Scott Boilen, Snuggie, Yahoo Finance on September 27, 2014 by ScottBoilen. In a Yahoo Finance segment analyzing the reasons behind Allstar’s successful Snuggie product line, Scott Boilen discusses the marketing power of humor. “So you kinda are in on the joke?” Lyster asks. “Absolutely,” Scott Boilen responds. This entry was posted in Scott Boilen in the News and tagged Allstar Products Group, humor, marketing, Scott Boilen, Scott Boilen Allstar CEO, Snuggie, Yahoo Finance on August 15, 2014 by ScottBoilen. In an Inc.com article entitled “How to Market a Brand New Product” Drew Gannon explores the phases one can take to turn an unknown name and product into a consumer success and Allstar Products Group CEO, Scott Boilen, offers a number of insights. “With tens of thousands of inventions conceived each year, turning an innovative new product into a consumer staple isn’t easy” Gannon reports. “It requires creativity, ingenuity, and persistence to break into a market and convince consumers they need something that never existed before.” The Snuggie blanket is a perfect example of how to turn an invention into a success. When Snuggie commercials launched in late 2008 the response by consumers was often sheer laugher. “[B]y the time the ad showed an entire snuggie-clad family cheering at a sporting event, some viewers were too busy laughing to pick up the phone” Gannon recalls. But Scott Boilen and Allstar Products Group had a solid marketing plan and they watched as four million Snuggies were sold in four months. “Within months of its introduction, the Snuggie transformed from a virtually unknown product into a pop culture phenomenon, appearing on The Today Show, referenced on hit TV comedy 30 Rock, and featured in the tabloids. Hundreds of Facebook groups and YouTube parodies spread awareness and boosted sales. “We’re a problem-solution company,” says Scott Boilen. “We show a problem to a consumer and give them an excellent way to solve it at a good price.” Scott Boilen and Allstar’s problem-solving method considers daily activities and enhances them with the introduction of a new idea. “Since introducing its three original colors in 2008, the Snuggie has relied on its consumers…to create the next generation of Snuggies” Gannon notes. This entry was posted in Scott Boilen in the News and tagged Allstar Products Group, marketing, product launch, Scott Boilen, Scott Boilen Allstar CEO, Snuggie on August 8, 2014 by ScottBoilen.